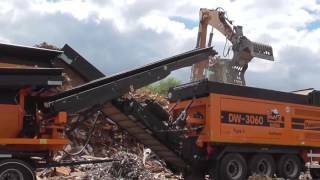 The Doppstadt DW 3060 BioPower wood shredder is a revolutionary first of its kind. This triple axle wheeled machine has been designed on the single-shaft principle but is fitted with a double set of teeth to enable greater volume reduction at minimal wear cost. The DW 3060 Type F BioPower offers output rates typically reserved for high-speed shredding machines. Due to the unque QuickChange system, the roller can be changed in no time at all, without the difficult and time-consuming setup of gearbox and support. This is also the case for the counterblade, which can be changed entirely without tools and from outside the machine for safety. To avoid feeding problems when using smaller tooth sizes the roller’s diameter has been enlarged to 800 mm. The fine shredding system 'Limiter' is an optional piece of equipment which 'holds back' the over-sized particles that make it through the initial shredding stage. And due to its gimbal-mounted components the Limiter is protected against any contaminents. Looking for a powerful, ultra-precise solution for your wood and waste shreeding challenges? The DW 3060 Type F BioPower is exactly what you want. The cooler is easily accessible. For self-cleaning, the large fan wheel is reversible. Powerful direct drive with electric reversing function. The motor is easily accessible from 2 sides. Safety mechanism to protect the machine and reduce wear life. The roller teeth tear the material through the hydraulically controlled shredding comb which opens automatically in case of large unshreddable contaminants. The comb elements are secured by wedges, easily accessible from outside and thus quickly replaceable. Easy operation, exact adjustment and reading of the machine data ensured with a multifunction display. The machine can be moved by wheel loader. Short setup times thanks to the hydraulically foldable rear conveyor.